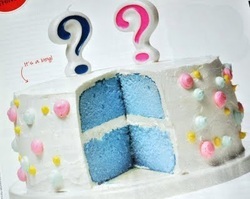 This trendy cake is a great way to announce babies gender with either a pink or blue cake at a family dinner or gender neutral baby shower. Ask us about our version of this cake for your special Reveal. 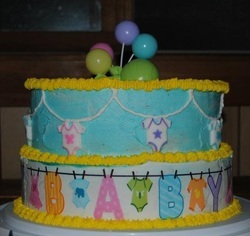 This was a two tiered cake with hand piped butter cream boards, editable images, editable baby one piece 1.5". . Cake topper was a set of pastel balloons and a rattle. 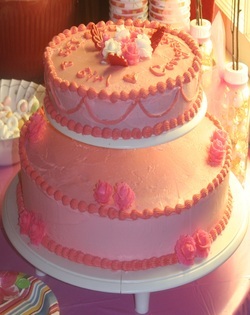 This was a two tiered cake with the bottom layer being a 14" cake and a 10" top layer. The roses where done by hand piping them out of frosting (the old fashion method) and red chocolate molded leafs. Each layer was a different flavor to insure that all the guest would enjoy the cake as much as they enjoyed welcoming Baby Paige. 1/2 Birthdays! A growing trend! Children celebrate summer birthdays during the school year! Holiday birthdays can now have their own special day! 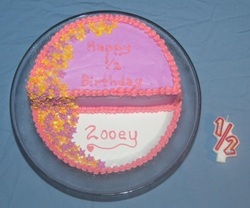 Share birthdays can now be split! A child turns 6-months old - a great milestone! Everyone LOVES a party and reason to get together! Zooey's 1/2 Birthday Cake Made 6/14/2012. This was a fun way for mom and siblings to celebrate her 6 month milestone. 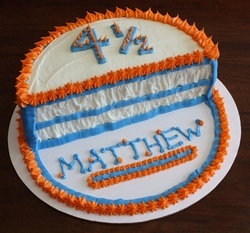 This fun cake can be made for any half birthday or added to a sheet cake to proving more cake for a bigger group.